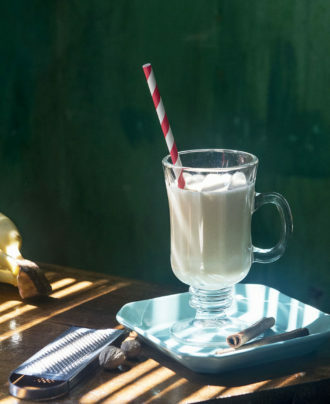 Taking notes from the classic Bananas Foster recipe, this holiday cocktail featured in the new Cuban Cocktails book tastes like a tropical hot buttered rum. Combine the ingredients in a pan and bring to a boil while whisking. Pour into a mug and top with grated cinnamon and nutmeg. In a large bowl, mash the bananas and add the rum. Chill for 48 hours in the refrigerator, and then fine strain. The rum will keep indefinitely in your liquor cabinet.